From time to time our users were complaining about the old calculator in the billing section: there were so many options that it was hard to know what to choose. We decided to change this. Today, we will tell you what has changed and how to select a tariff plan so that you don't have to overpay. There were many confusing options and limit ranges in the old calculator, which were difficult to customize. We updated it: we eliminated additional functions, added more limit options, and focused on what's important: apps, monitoring, ASO, and replies to user reviews. 30 apps and more allow you to keep track of a business of any scale. 5. 100 API requests per day are included in all Premium plans, no matter their cost. 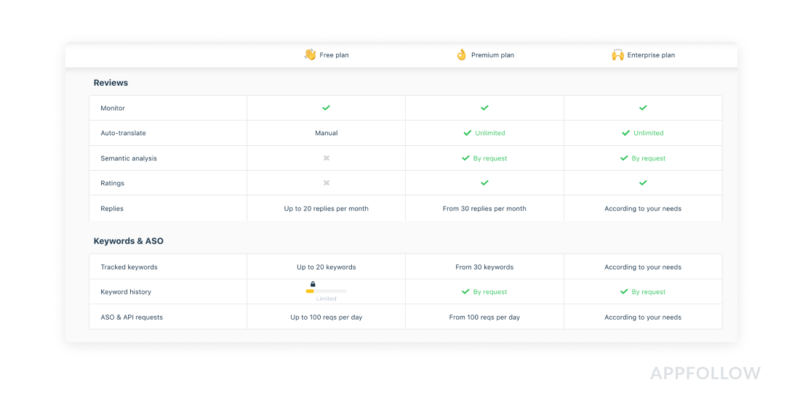 Rating and Featured dashboards are included in any Premium plan. 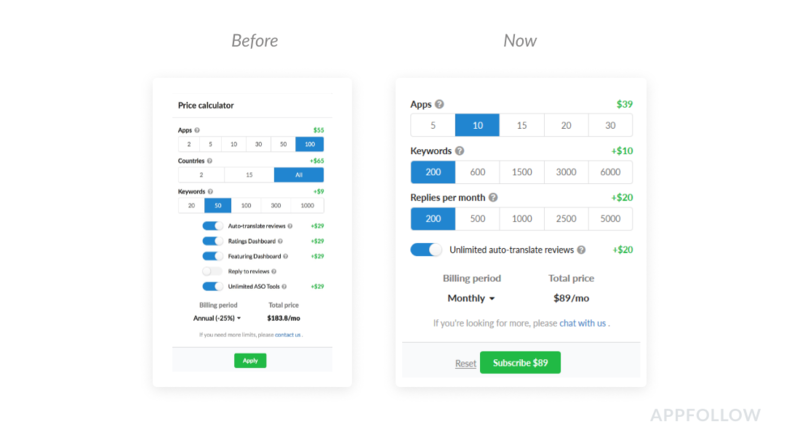 At the pricing page there is now a detailed plans comparison. We know how difficult it was to navigate without this table. Talking about plans, we still have three main plans: Free, Premium, and Enterprise, and also a special offer for indie developers. Free plan remained the same. You can track two apps in two countries, analyze 20 keywords, and reply to 20 reviews each month for free. You can also use all our integrations and API (up to 100 requests per day). Premium plans differ depending on which AppFollow tools and features you use: monitoring, ASO, or reply to reviews. New calculator logic allows you to quickly change limits when needed. ● Reply to reviews: from 30 to 5000 reviews per month through any integrations. Additionally, you can turn on limitless review translations (right now we are considering the possibility of translating your answers too). There are Rating Monitoring dashboard and Semantic Analysis available — contact us to turn this on for free. Premium plans don't include Single Sign-On and account payment. In the Enterprise plan users have more flexibility in terms of keyword limits, reply to reviews, and API requests. Here it is easier to set up team work: no restrictions to the number of users and Single Sign-On support. We are now working with four SSO services: SAML 2.0, Okta, Onelogin, and G Suite. More details in our Help Center. Enterprise users get priority support (a personal account manager) and pay against invoice. Additionally, we provide dedicated servers and customized tools and reports by request. There is now a special offer for indie developers. It covers additional limits for keywords and replies to reviews for the minimal price. 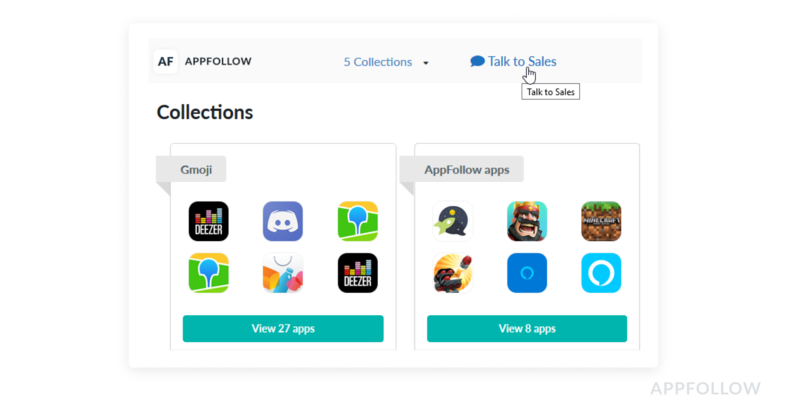 To get this special offer you need to integrate AppFollow with your App Store Connect and Google Play Console. New flexible limits help you focus on your main goals. 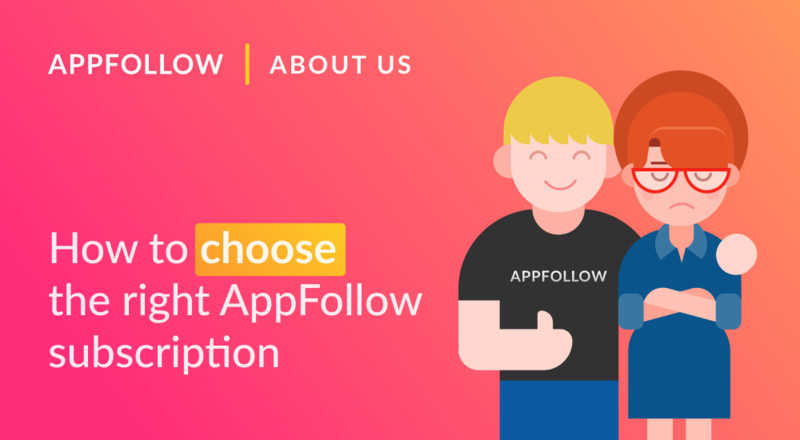 We developed them considering the needs of 35,000 AppFollow users, and in this section we'll share few suggestions on how to use them to the max. This plan includes all Premium notifications and dashboards. And don't forget to try our new Semantic Analysis — the fastest way to understand what your users want and what the app needs to appear in the top charts. If you are monitoring several competitors or market leaders, 5 apps will be too few; select 15 or more. Add keywords you need, track your competitors, and adopt their successful ASO ideas. 1500 keys are quite enough for the study of 5-10 locales. If you want to improve your positions worldwide, choose a limit of 3000 and more. By the way, our new section ASO Analytics is already in your dashboard — be the first to try it. Don't forget to add a minimal package of replies to reviews to work on users complaints, so the app rating won't drop. Auto translations will help you understand the users needs in any language. Send us a message to try the new Semantic Analysis. It helps in analyzing users mood and quickly finding problems and weaknesses. If the support team works in different countries, receive app reviews in different languages in different services. For example, Spanish-speaking agents can get app reviews in a special Slack channel, and English-speakers can reply from Zendesk, etc. 15% discount for the annual subscription. Looking for a personal offer? Tell your account manager which options you want to access most of all.